Well, this was about as good as I expected it to be. And since I didn’t have high hopes, I can happily say I was not disappointed! The Black Cauldron has none of the charm that a typical Disney movie usually has. Not that taking risks is necessarily a bad thing, but it does not pay off here. The entire film is dark, with very little levity and color. There’s no singing. The villain is very scary looking and commands an army of the undead. It features a pig who can foretell the future, but can’t talk. When your target audience is (and really always has been) young children and their mothers, then they probably aren’t going to enjoy this movie. On the other hand, this movie includes a fair amount of Disney animation cliches. It features a boy hero with a fairly one-dimensional personality, and an instantly forgettable princess companion. They are accompanied by an annoying animal sidekick, and the villain has one as well (they both talk, and made me long for the mute pig). The ending is predictably happy. If you’re looking to expand your audience to preteens, teens, and men, they they probably aren’t going to enjoy this movie either. The Black Cauldron tries too hard to appeal to everyone and fails miserably. It really makes you appreciate the excellent storytelling in just about every Pixar movie, and in Disney films like Beauty and the Beast, Tangled, or Frozen. This is such a disappointing film. It’s hard to believe it was made by Disney. They went through a period of failure in the mid-80s and this adaption of The Chronicles of Prydain by Lloyd Alexander was right in the middle of that era. 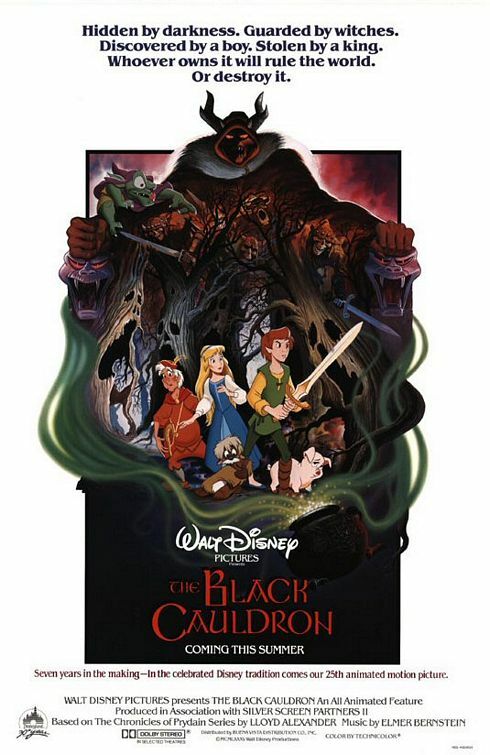 The Black Cauldron, along with other box office and critical failures like Oliver & Company and The Great Mouse Detective nearly bankrupted Disney until they got things back on track with what many consider to be their golden era of the early 90s. I had never seen this film before last night. I bought it for Sally as a present because she collects Disney films and this was one of the few she didn’t own. I’m still struggling to believe this is actually a Disney film. It is such a departure from anything they’ve done before. It is very dark, especially for a Disney movie, and it lacks the heart and fun that Disney is renowned for. There is no music or singing in the film, just a dark and moody score that I found upsetting. The film revolves around an assistant pig handler (Apparently that’s a thing) named Taran, who longs to be a great warrior. One of his pigs can tell the future (random!! ), so the ‘horned king’ (That’s his actual name??) requires this fortune telling pig to help him find the location of the Black Cauldron. The Cauldron is said to have magical powers that will raise an army of the undead and let the Horned King take over the world. When this magical pig is stolen, Taran sets out to rescue his pet from the Horned King and save the world. Along the way, he meets princesses and wizards and mythical creatures of all types. As you can see, this is a pretty dark movie. No other kids movie that I can remember revolved around creating an army of zombies. There is very much a Lord of the Rings feel to this film. There is even a small dog like thing called Girgi that reminds me a lot of Gollum if he were voiced by Donald Duck. As I said earlier, this film lacks heart. I had a real problem that the characters were all racing to save a pig. Only George Clooney cares about pigs. I don’t know why they didn’t make the future telling macguffin a more relatable animal, like a dog. This is a very disappointing film. There is a standard that Disney have set with their films and this is not up to it. The only benefit I can give it is that it’s only 80 minutes long. Apparently it is so short because a lot of the film had to be cut by over ten minutes because parents walked out of theatres during test screenings. It’s easy to believe this is the film that nearly bankrupted Disney. Thankfully, classics like The Little Mermaid, The Lion King, Aladdin, and Beauty and the Beast were just around the corner.